Happy Spring! It is the Spring Equinox and officially winter is over! Hope you have beautiful seasonal weather in your world. In my world we're waiting for snow to melt and hopefully to be done with. We don't need any any new snow falling from the sky until next winter. The weather has to get beautiful soon! Today I want to say THANK YOU to the team over at Try It on Tuesday. I'm honored to be offered this chance to be a guest hostess. 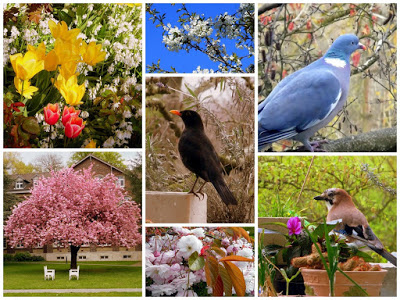 The new theme is this The Call of Spring based on this beautiful mood board. Here's my journal page inspired by these gorgeous photos. I began by pasting some strips of a book page onto some watercolor paper. Then I stamped the bird (Stampendous) in the middle of the page. I doodled and painted some flowers and my tree branch. I also outline them with some watercolor crayons and Stabilo pencils. Once the images were finished, I stamped the words onto the page. I hope you are as inspired by this mood board as I was. We'd love to see you over at Try It On Tuesday for this challenge in the next 2 weeks. And with the spring theme I am linking up to Art Journal Journey and Rosie's challenge there which is also spring. Thanks Susi for suggesting I do that also. 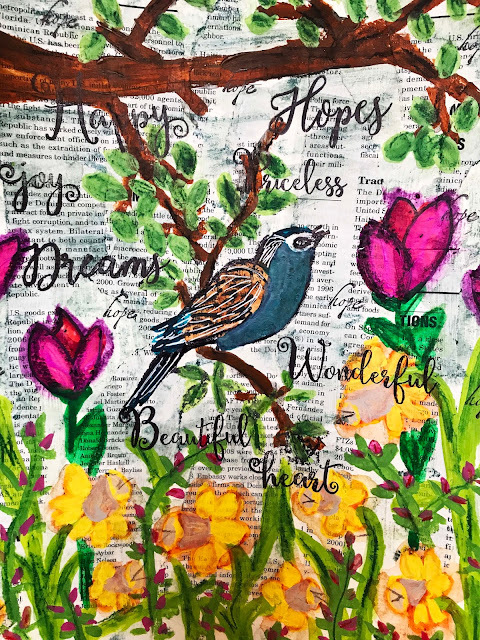 A beautiful spring page and montage Erika! The snow is gradually melting here too, let's hope we get some spring weather soon, I'm fed up with being cold! Would fit AJJ as well dear Eika, maybe you can link to the collection as well- would be great! Thanks bunches for being our Guest Designer and inspire us all at Try it on Tuesday! Love your page - it's so joyful! The only way I can see Spring is to look at your beautiful page and inspirational mood board. I take it you're not getting the Four'easter tomorrow? Lucky you! I'm going to wedge myself on the window sill in a fetal position with Ben Dover. 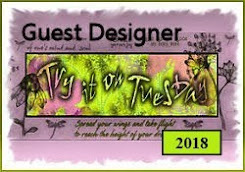 First of all thank you for being our Guest Designer at TioT's for this challenge Erika. The page you shared looks beautiful , pretty spring flowers, a lovely bird and great words. It promises spring is on its way. We are all hoping it won't be long in coming. Congratulations on being chosen to host at TIOT, Erika. Your page is wonderful and so is the theme. I really like this page -- your daffs are so good! And what I love most? The word "hope!" Not sure how I missed this, but I love your beautiful art you created. You will be a great guest designer because your art is simply stunning. Also, thanks for sharing this with us at Art Journal Journey, too. A beautiful journal page, full of Spring colours and images. I'm like you, just can't wait for Spring to arrive and stay. Lovely to have you join us as our Guest Designer for this cghallenge. I love seeing daffodils in spring art. Yours are lovely! First of all, congrats on being a guest over on ToT, your page has really captured the moodboard and is beautiful and so Springlike! Here the snow has melted away thank goodness, yesterday was a beautiful Springlike day, today is a bit more grey, but as long as there is no more snow I am happy. Have a good rest of the week! We are off to Oz as of tonight, so I won't be able to visit for a while, hope you have an amazing trip to Japan!! What a Happy display Erika, we can officially say Spring is here!! Your overlay of images captures the beauty of nature surrounded by those positive words. Thank you so much for sharing. Congrats on being a guest designer on TIOT! Your page is absolutely beautiful - I like the background, the colors, the flowers, the tree and of course this pretty bird!